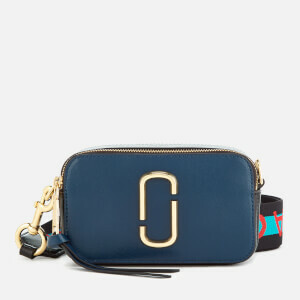 Women's leather crossbody bag from Marc Jacobs. 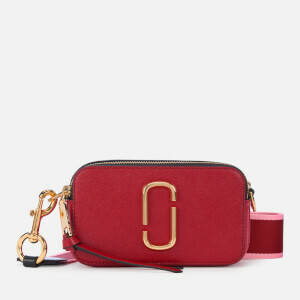 Crafted from crossgrain leather with a structured silhouette, the 'Snapshot' colourblock camera bag is adorned with the brand's iconic 'Double J' logo to the front and fastens with a dual zip fastening that opens to reveal two separate interior compartments, one with a slip pocket for extra storage. Finished with a seasonal detachable webbing strap, oversized tassel zip pulls and a slip pocket to the rear external. Gold tone hardware. Arrives with a branded dust bag. Dimensions: H: 11cm x W: 18.5cm x D: 6cm. Strap Drop: 70cm.